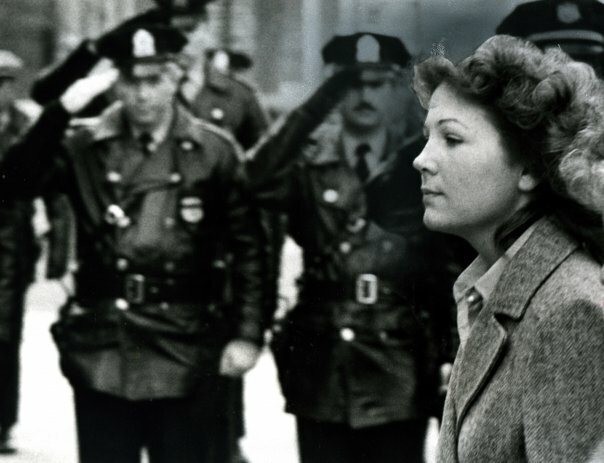 Maureen Faulkner at the 1981 funeral of her cop husband Daniel Faulkner. It was a sell-out crowd, and, in addition to old neighborhood buddies, their younger ilk, a strong FOP presence and a few scattered journalists, there was more of a political presence than I expected. Throughout Hill’s film, Gov. Ed Rendell, who was district attorney from 1978 to 1985, kept insisting on how overwhelming the evidence was, suggesting that the decades-old controversy was nothing more than the result of confusion, orchestration and a smart, successful manipulation by Jamal, from behind prison bars — where he is still on death row pending appeal. If there was ever evidence for that, it was the presence of much of the city’s political elite. Mayor Michael Nutter and former District Attorney Lynne Abraham were there, as were possible (and former) mayoral candidate Sam Katz and talk show host Michael Smerconish, who co-authored a book with Faulkner’s widow Maureen Faulkner, who was also present, as was Councilman Jack Kelly. I also saw current District Attorney Seth Williams and 2009 Republican candidate for city controller Al Schmidt. Even for Philadelphia, that’s a lot of Democrats — Katz was once a Republican but has since returned to his original Democratic registration, making Kelly and Schmidt the lone Republicans I noticed — for a documentary that takes a fairly hard stance on what is considered the right-leaning side of things. Race is involved, too, as Jamal has largely been seen by his supporters as the victim of mainstream white oppression. Though elected with great help from white voters, Nutter and Williams are both black, meaningful for the particular case and the city’s long racial divides. Katz,who is white, has also reportedly been chasing black support for another mayoral run. With those reasons to not attend as politicians, their attendance seems to suggest the opposition isn’t seen as all that credible. Below watch 6ABC coverage of the documentary, which debuted the same night as a rival take defending Jamal. With little exception, the crowd was decidedly and vocally certain of Jamal’s guilt. If their applause during the documentary when choices phrases highlighted that perspective didn’t make that clear enough, the handful of times someone shouted out ‘kill him’ did. Basically, the premiere had the feel of a beef and beer and political fundraiser mixed in with a rally and film showing. That might be like other premieres. I wouldn’t know. It feels uncomfortable when media — documentaries, news pieces or anything of the like — bring about rounds applause. Something seems like they should make people think, not rally. That said, filmmaker Hill, as he did with his popular 2006-released documentary Shame of a City, focused more on what he thought was the truth than objectivity for objectivity’s sake, a sentiment foreshadowed during the night’s opening remarks by the film’s executive producer Kevin Kelly, an organizer in a younger, more progressive Republican movement in Philadelphia. Below, watch the film’s trailer. Barrel felt very similar to Shame. You might say it is Hill’s motif: black titles with white text, broken up by TV news clips and live footage of rallies and interviews. Michael Smerconish was in both — and wrote a review of the film. A stance from the filmmaker felt very present. Two recurrent conventional wisdom defenses of Jamal’s guilt is his brother’s refusal to ever testify and the remarkable coincidence it would have to be for Jamal to be stationed at 4 a.m. exactly where his brother was pulled over for going the wrong way down a one-way street. …But I kept wondering how Jamal could have known that was where his brother would be pulled over if the crime was pre-meditated. I may be missing something simple, but I wish there was a more continued focus on the details of the case. Philadelphia and race were mixed in, of course, and it does seem like Hill likes very much to be a black man taking a stance that comes in opposition to those of a lot of black men involved in the issues. I felt like there was some confusion between the debate about whether Jamal shouldn’t receive the death penalty because that form of justice is immoral or because he was truly innocent. There’s a real distinction there that I didn’t always feel. Hill started off with a great portrayal of the scene and time (the “combat zone” of 12th and Locust, which is now the gosh darn gayborhood) but then jumped the shark a bit with a long-winded dissection of Jamal’s participation with the Black Panthers. It was provocative as far as being a motive — Jamal killed Faulkner as a revolutionary act — but it seemed to fall flat by not even addressing where the Panther movement came from, regardless of how ideologically distant they are. So, mostly I was a bit underwhelmed, though it didn’t help that I am personally more interested in the Katz-Street mayoral election from Shame than I am in the 30-years-old Jamal case. That said, it might have something to do with the first seeming to do a better job of moving from humor to drama to fact, with certain perspective interwoven. 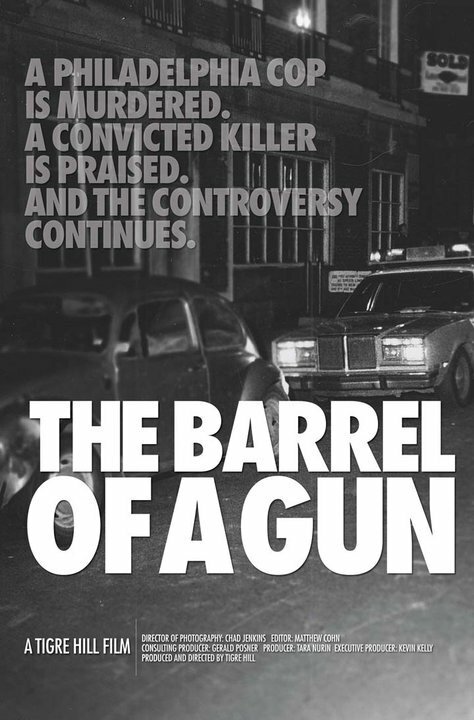 Barrel just seemed, like with the applause of the event, very reaffirming, more than Shame. Tigre Hill is easily one of the most serious, best known documentarian making feature films about issues in Philadelphia. I enjoyed it because of the subject matter and the discussions, but I’m not sure if it furthered the conversation as much as others have said. I very much look forward to what Hill will do next and would happily pay for another of his film’s premieres or recommend someone buy Barrel if they have particular interest in the topic or perspective.